Equimarginality....wait, equi-who? Equimargina-what? It's a big word, but it's one many environmental economists use explicitly a lot and a concept others also use frequently, if not stating it as such. And it sets the stage for the politics of ecosystem service markets. It's kind of the holy grail or lynchpin of environmental economics really. If "command and control" policies - that is, mandating that each firm, or each sector even, use the "best available pollution abatement technology" - fail, it's because, the story goes, these policies don't acknowledge the fact that each factory or wastewater treatment plant or housing developer has unique cost schedules for dealing with whatever their external cost to society happens to be. Some firms can mitigate emissions, effluents, or habitat impacts more easily than others. Instead of setting a quota on the amount of emissions, the state levies a tax on the emissions (P*), the idea being to change underlying incentives that spur a firm to generate CO2. You can see that if all firms had to produce only, say, EsubB emissions, the regulation would be far cheaper for some (Firm A) and much more costly for others (Firm C). 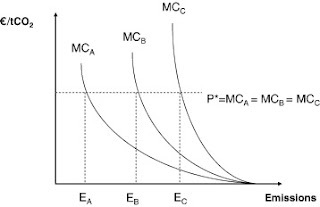 The idea with equimarginality is that, across firms, there is some magical point where "society's" extra buck spent on abatement or conservation doesn't return more than dollar's worth of pollution reduction or habitat protection. 1. In theory, the efficient amount a polluter should abate will depend on where it pollutes. If your car is pumping out SO2 in the middle of the Mojave Desert, I mean, what effect is that having on society, really? (beyond acid rain...) Since the health effects of vehicular SO2 are quite localized, the answer is probably very little, so why should the driver have to pay as much in fees as someone driving the same car in downtown LA. Well, it's extremely hard to know how much each vehicle is driven where...And it's even tougher to pinpoint how much that 1999 Saturn XL CA license plate #304 ACL's exhaust contributes to the weathering of Lexington, Kentucky's grand limestone edifices. 2. By the same coin, where polluters do mitigate will be where it is least costly to do so. All things being equal, if I'm given the flexibility as a wind energy company putting up turbines in the mountain West to abate my turbines' impacts on sage grouse habitat, I'm going to do so where it's easiest to. That's probably where land is most expensive anyway and where the wind isn't as good. That may or may not have anything to do with the quality of sage grouse habitat there. I find that equimarginality plays out in an interesting way in habitat and species banking, because where firms can destroy or compensate for habitat is perhaps more (ecologically) important than with carbon or water, and so has important political implications for landscape conservation. When it comes to carbon, what you hear is a carbon sequestering forest there is as good as one over here. But with habitat, the wetland here may serve an especially valuable role for species migrations in the landscape, a role that can't necessarily be replaced over there. For conservationists, there's a value in particular ecosystems in particular places. Again, the question is whose values win the day, or in what combination? To what extent can and will state agencies step in and say to developers, "look we don't want you mucking up habitat here. And if you are going to make an offset to an impact, how about not necessarily where it's cheapest for you, how about over here where we think it's going to have the most effect?" My goal here has been to show how on its own terms the logic of equimarginality is: 1) in principle, spatial; 2) how this pursuit of spatiality, at a minimum complicates environmental economics, but really, I think, makes the whole notion of equimarginality more or less useless, except as the object of ecosystem service politics.